*** TWO-TIME CHAMPS — The Tualatin High School softball team won its second Class 6A state championship on Saturday with its 4-3 win over Clackamas in the title game held at the Oregon State University Softball Complex in Corvallis. The Timberwolves got their first state title back in 2015, when they scored a 10-0, five-inning win over Westview. Tualatin played in two other state championship games. The Wolves fell 3-2 against Westview, in eight innings, in the 2004 Class 4A state title game (current Tualatin coach Jenna Wilson played at first base for the Wolves in that game). Tualatin also lost 4-0 to North Medford in the 1998 Class 4A state title game, played at Erv Lind Stadium in Portland. 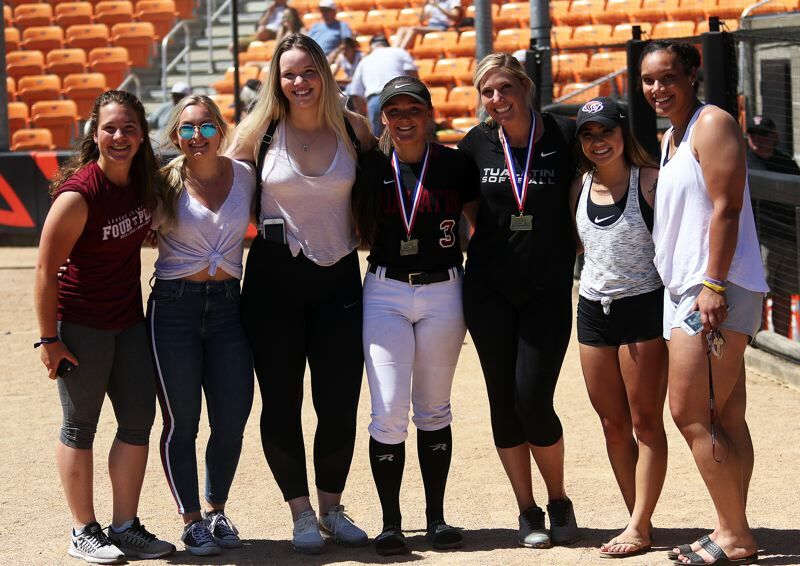 *** RETURNING CHAMPS — Among those cheering on the Tualatin squad during Saturday's state title game were five members of the Timberwolf squad that won the state title in 2015 — outfielder Tanna Baggenstos, catcher Nikki Miller, second baseman Amanda Reser, first baseman Camryn Robbins and outfielder Caitlyn Sung. Of course, one other starter from that 2015 Tualatin team was also at that game, current Timberwolf senior Taylor Alton, who started at third base for both Tualatin title teams. *** PLAYERS OF THE GAME — Senior catcher Ella Hillier was named Tualatin's Moda Health Player of the Game for her play in Saturday's state championship contest. For the game, Hillier went 3 for 4 at the plate with two runs scored and an RBI. Senior Trinity Loeb was named Clackamas' Moda Health Player of the Game. She went 3 for 3 at the plate with a home run, a double, two runs scored and an RBI. 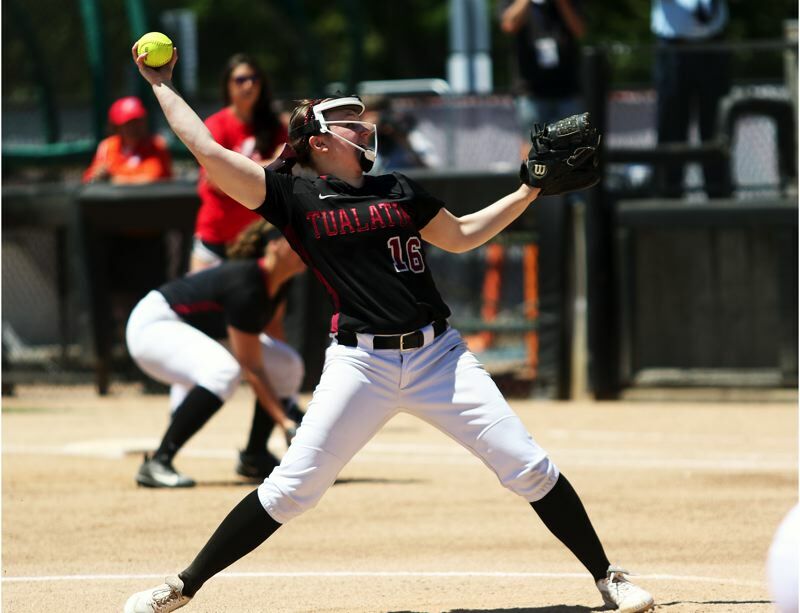 *** PITCHER/ACTOR — Tualatin High School senior Megan Woodward pitched the Wolves to the victory in Saturday's Class 6A state championship game, but that's not her only claim to fame in the 2017-2018 school year. She also had the lead role of Juliet in Tualatin High School's punk version production of the William Shakespeare play "Romeo and Juliet." "I do a lot of theater. I love softball and theater both," Woodward said following Saturday's state championship game. "One helps me with the other. Theater gives me confidence not to let anything shake me on the mound." Nothing seemed to shake her, either on the softball diamond, nor on stage. "It's been a great senior year," said Woodward, who will attend the University of Idaho next fall. "I missed a few games (due to the play), but my team had my back."